This video-enhanced eBook is designed to be read in the iBooks 2 application on the iPad. For readers new to iBooks, we’ve posted a quick tutorial to help you get started (see link at right). Disc golf is a fun sport that has experienced a surge in popularity in the past decade. The basic equipment is not expensive and most disc golf courses are free to play. There are currently over 3500 disc golf courses in the United States. 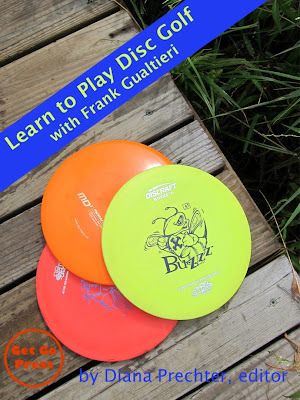 Video lessons by experienced PDGA player and high school coach Frank Gualtieri can help you get started by understanding the basics. Didn't quite catch something? Each chapter's text is the identical material that's in the video, with lots of pictures from the video, so you can review previous chapters or simply learn at your own speed. Our goal is to give you knowledge and confidence to start playing disc golf.